DentaSoak persulfate-free retainer, denture, and dental appliance cleaner is a combination of two types of ingredients: a liquid and a powder. To use DentaSoak, mix the liquid packet together with cold water, add the powder packet, then close and gently shake the soaking bath (included). Watch the video. Once the solution is mixed, it lasts for ONE WEEK. That's right, you mix it once, and use it to disinfect and clean your retainer all week long. At the end of the week, simply spill it away and mix a new batch for the following week. An incredibly convenient solution for kids who are lazy about keeping their retainers or mouthguards clean! Each DentaSoak Starter Kit contains enough solution-making packets to last 3 months. The DentaSoak Starter Kit comes with one special soaking bath which will accurately measure the amount of solution you need to make. The soaking bath is specially designed to help you mix the product correctly, and includes a handy lift-out tray. (Although the soaking bath is quite spill resistant, we recommend that you mix and shake the product over a sink). DentaSoak has a minty-fresh fragrance, and it's the perfect solution for people who are allergic to the ingredient Persulfate. In just one 15 soak per day, DentaSoak kills 99% of bacteria and keeps your retainer free of smelly plaque build-up. After soaking your retainer for 15 minutes, rinse it with cool water. The manufacturer advises that you do not soak your appliance more than the recommended 15 minutes. This product is NOT recommend for retainers that contain metal solder; those should not be soaked in any product. Each box of DentaSoak includes a soaking bath, full instructions, and enough solution-making packets to last 3 months. It's great for all types of removable dental appliances, such as retainers, aligners, mouthguards, snoring and apnea devices, and even dentures! After you finish the Starter Kit, you can order DentaSoak Refill Kits, which do not contain the soaking bath. Invisalign® and Vivera are registered trademarks of Align Technology, Inc.
Watch our video: "How to use DentaSoak"
DentaSoak is not sold in local stores. You get one mixing cup and a three-month supply of DentaSoak, plus full instructions. The manufacturer advises that you do not soak your appliance more than the recommended 15 minutes. DentaSoak does not contain Persulfate. Sorry, we do not have a list of other ingredients. If you have an allergy concern, please contact us. Safe for all types of dental appliances: Hawley retainers (metal and plastic), Invisalign, Essix Retainers, Bridges, Partials, and even Dentures! Each mixture lasts 7 days. Kills 99% of bacteria and removes white plaque buildup (removal of buildup may take 3 to 4 soakings). If DentaSoak has prolonged contact with porous surfaces (e.g., marble) it may cause discoloration or even a slight etching effect to the surface. Please be careful if your countertop is marble. Note: If you have a clear plastic (Invisalign-type) Essix retainer, and amalgam (metal) fillings in your teeth, the fillings may create unremovable black stains on your retainer. There is no retainer cleaner on the market that will remove these black stains, because the plastic of your retainer has actually changed color from the metal in the fillings. Ask your dentist or orthodontist if you need more information about this issue. Confused about which retainer cleaning product to buy? See our Retainer Cleaner Comparison Chart! DentaSoak is the perfect solution for people who don't have the time to mix a retainer cleaning solution every day. Just mix up one batch at the beginning of the week, and you're good to go for the rest of the week. If your retainer has white plaque buildup, DentaSoak will remove the buildup after 3 or 4 soakings. Then you can continue to use the product daily to prevent the white buildup from coming back. Another advantage is that this product doesn't contain the chemical Persulfate. It's one of the few dental appliance cleaners on the market which doesn't contain this chemical. Customers sometimes ask whether they can use DentaSoak with one of our sonic cleaners. The answer is: no. The solution needs to be carefully mixed using the cup that comes with the Starter Kit. Otherwise, you may dilute it too much (or not enough). If your retainer contains metal solder, you should not use ANY product that involves soaking. Even if you follow the manufacturer's instructions exactly, the solder will most likely crumble over time. (It's also easy to forget and soak your retainer longer than recommended, exposing it to the chemicals which will effect the solder). The only products we recommend for retainers with metal solder are Cleanse Freshen Go wipes or spray, and OAP Cleaners. My daughter started wearing her Essix retainer 2 weeks ago. I ordered the starter kit and am waiting for it to arrive, but wanted to make sure it is ok to use warm water even though the orthodontist said to use only cold water. Will it work with either cold or warm water? I was told by my daughter's orthodontist to use cold water when cleaning. They instructed to use hand soap and a q tip. I'm finding that it's not working well so I am giving this a try. Based on the reviews, I am hoping it will help. Great question, Christine! DentaSoak works with cold water, so you will be fine using it as your daughter's orthodontist instructed. Remember, you mix DentaSoak once and use it for an entire week, so of course the mixture stays cool (or room temperature). The thing that you must be most careful of is using very hot water on an Essix retainer. Lukewarm is OK, but hot is bad! Your orthodontist is warning you about this so that the retainer doesn't warp due to the heat. Be sure to never leave it in a hot car or in the hot sun, either! And of course, never microwave it or put it in the dishwasher! Is there a watertight version of the soak bath available? This product is convenient since the mixture needs to be prepared only once a week, but it is difficult to travel with a container that leaks. Great question, Jon! No, DentaSoak doesn't come with a water-tight soaking bath. However, you can mix the solution and put it into a leakproof plastic container. It's easy to find such a container in most supermarkets. One with a screw top would probably work best. For extra assurance, you might want to then put the container into a plastic zipper bag to ensure that nothing leaks. Can I leave my retainer soaking in this for longer than 20 minutes? If I do, will anything happen? We have found that if your retainer does not contain metal solder, soaking longer than 15 to 20 minutes should be fine in most cases and should not harm your oral appliance. (Most soaking solutions will dissolve metal solder after a period of time). If you're not sure whether your appliance contains metal solder, please ask your dentist or orthodontist. Some customers have told us that soaking a clear plastic retainer (like Invisalign or Essix retainers) in DentaSoak for longer than 20 minutes has sometimes resulted in the retainer picking up a blue tinge from the color of the DentaSoak. The blue tinge usually disappears over time, however. With that said, please be aware that the official manufacturer's instructions recommend that you do not soak your oral appliance longer than 15 to 20 minutes. When in doubt, we suggest that you defer to the manufacturer's instructions. Retainer Brite 3 Month Supply 96 Tablets - ON SALE! OAP Foaming Retainer Cleaner - Persulfate Free! I received it and used it today and now my retainers look like theyre brand new. My orthodontist performs an annual checkup of my retainers to make sure that they're still well-aligned and doing their job. Each time he checks them, he exclaims, "They look like they were just made yesterday!" This is after 5 years of soaking my original retainers in DentaKit for 15 minutes each day. It's so easy to do because there is no scrubbing involved. It leaves retainers with no buildup, no plaque, and no residue. Absolutely clean! The product works very well, and I like that you can use the same solution mix for a week. There was one big issue for me, and it was just with the instructions. The only instructions you get are on the box. It explains how to make the solution, and that it will last a week. But there's one thing, no where does it say "leave containers in solution FOR 15 MINUTES AND TAKE OUT". I was under the assumption that you would leave your retainers in there all day (since the solution lasts a week) So when I left my retainers in there for over an hour, they turned blue! They were ok, most of the blue came off when is washed them with water, and the rest came off a few days later. I went back online, and they had better instructions, and it does say that you shouldn't leave the retainers in for longer than 15 minutes. But the actual product is great, it really cleans well, a lot of the white stuff that had built up on my retainers over the years is coming off (not at once but I can see the changes.) And the retainers just feel cleaner when I wear them at night now. Would recommend, just make sure you leave them in for 15 minutes and take them out. Merchant Response:The instructions on our website say: "After soaking your retainer for 15 minutes, rinse it with cool water. The manufacturer advises that you do not soak your appliance more than the recommended 15 minutes." Product works 10/10. I would recommend this product to anyone who owns retainers. I have a custom night guard and everything else I have tried has never kept the night guard clean with no yellowing. I'd have to take it to the dentist with me to have it cleaned. Dentakit solved that! VERY PLEASED! After searching for a sometimes how to clean your Retainer, I'm glad I finally found Dentakit on YouTube. 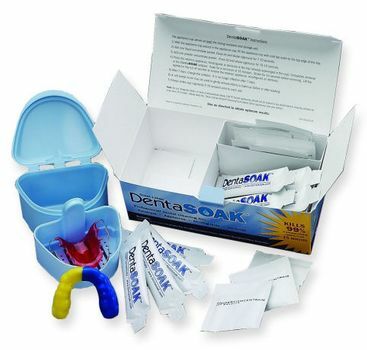 I am very satisfy with Dentakit Soak. I had so much built-up. After using Denta Soak, my Retainer looks brand-new & bacteria free. Thanks Dentakit. Kit arrived on time and in good condition. It is easy to mix and use. However when shaking to mix it does leak out of the cup. Best to mix it over the sink. ConsLeaks out of cup when mixing. Best to mix it over the sink. Cleaned retainers; they don't look like new when dry but most of the caked on minerals came off. Merchant Response:If your retainers have a lot of white plaque buildup, it usually takes 3 to 5 consecutive cleanings to get all of the buildup off. DentaSoak does an excellent job of this. Followed directions and time constraints exactly. Still stripped the solder from my Hawley retainer. Tried putting wax over the solder with mixed results. Stopped using. Merchant Response:We're sorry to hear that you had this experience. We clearly state on the product's page that this product is not recommended for retainers with metal solder. We don't recommend soaking a retainer containing solder in ANY product. If your retainer contains solder, it needs to be cleaned by hand with a cleaner like OAP or Cleanse Freshen Go. ProsDid get rid of the white calcifications at least. But almost wrecked my retainer. ConsNot good for soldered retainers. I have been using the Denta Soak for two weeks now. It is impossible to place or remove the dental appliance without some dripping. I have a marble vanity top and discovered too late that the solution etches the finish of the marble! Be careful with drips and spills. If you have marble I wouldn't recommend this product at all. Merchant Response:We do state, in the product description, that you need to be careful with the product on marble surfaces. We're sorry to hear that it caused a problem for you. Convenient, but still have to manually clean retainer afterwards. Been using this for 2 months. Still comes out with film on the retainers. I soak them for the 15 minutes and thoroughly rinse. I have to then wash them with hand soap/q tip to clean the film off and not all of it does come off. We clean them after each meal and use the soak at night so we do keep up on cleaning them daily. Make new soak every week. After reading the reviews I was hoping we'd get the results others have. ProsConvenient soak. Mix weekly, soak 15/day and rinse. Persulfate free. ConsDoesn't get the film off. Sill have to manually clean my daughter's retainers afterwards. I've only had it for a couple of weeks so too soon to tell much but it seems to be working just fine. The case needs to be held over the sink while shaking as drips fly out and if you leave your retainer in more than 15 minutes it might turn a bit green which will leave after a few brushings. It really does what it says it will do...the white film came off my invisalgn retainer beautifully after 4 soakings. Would recommend this product! ConsDon't shake to mix too hard, it will leak out. Rinse out sink well after disposing, may damage finish on drain ring. I like how this product keeps my retainer clean and fresh. Very easy to use! I took off one star only because the case does not seal tightly and when you are shaking to mix it leaks. But that wouldn't stop me from reordering when the time comes. This is a great product. My retainers are a couple if years old and were looking quite gross. Once I started using DentaSoak I saw an immediate improvement and by the end of the first week, they look brand new. It is so nice to use a product that truly does work as advertised! ProsEasy to use. Does the job. Removes the white build up. What a time saver and my retainers are sparkling clean. So easy to make the solution once a week instead of daily. Great product. Using it to clean my Invisaligns. I love my retainers, and wear them 24/7. I am very picky about them, they are very expensive. This product does a great job of cleaning all the yucky stuff off so they look great. Mine are glow in the dark blue and look great. ConsI overfilled the cup and spilled it. Gera Gera Po! (LOL). This is the only cleaner I've found that can actually dissolve the white, caked-on plaques on my retainer. I've tried denture cleaners, but they seem to do nothing. I was so relieved to find this. Awesome, effective cleaner that solves the problem completely. ConsNone. I love this stuff. I was hoping to find something to get rid of that nasty, white build up on my retainer. After a lot of reading, I decided to try DentaSoak mainly because I wanted a persulfate-free cleaner. Why expose myself to a questionable ingredient, right? Well after just ONE week of use, the build up is just about completely GONE! And not only that...I had an annoying rough patch on my retainer that is now smooth as a baby's bottom! I thought it was a defect from when it was made, but apparently it was some kind of yucky stuff that had built up over time. DentaSoak was simple to use - especially since you make it once and it's good for the entire week. I just pop it in the little hopper for 15 minutes while I'm getting ready for work and it's cleaned and ready for that night. I am so pleased with the results! My retainer is truly like new again! I feel confident that my Essix retainer is clean and sanitary after the 15 minute soak. The only negative is that the wash container leaks a little while you're shaking the solutions. I really like that this product does not contain persulfates. It works well and I have no chemical taste. I'm happy with it. My retainers are so fresh and clean after soaking in this product. I love it! I was so sick of the white buildup on my retainers that I couldn't brush off. After soaking in this, I was able to brush it away with a toothbrush. The buildup turned to blue but it was being dissolved by the solution. This was amazingly easy to use and I so happy I tried it. Whole heartedly recommend!! The kit is easy to use and maintain. Instructions are simple. It was delivered quickly and is as promised. I'm very happy with this product. I took very poor care of my retainers. Over 10 years of white plaque stuck on them. I finally realized how disgusting this is and looked for a way to clean them. Dentasoak was recommended for getting white buildup off of retainers. It didn't create much visible change in the first week of use. The second week - my God. I had forgotten that the plastic in retainers are supposed to be TRANSPARENT with a pinkish hue, but that's what they look like now. Great product. Quick ship. Easy to use. All you need in one package. Love that I only have to change the solution once a week and that my mouth guard doesn't taste stake anymore.